Frame: a pattern of lights on your keyboard. Defined by a picture with location and size, and the position and size of the keyboard overlay/mask. Frame set: one or more frames saved together to become an animation and exportable to LGS. The right side of the main window shows the frames you’ve captured into the current frame set. The main window contains three control areas described below. Click on a portion to learn more. ﻿Use ﻿the ﻿Canvas ﻿View ﻿to ﻿move ﻿and ﻿resize ﻿your ﻿image ﻿and ﻿a ﻿shadow ﻿of ﻿the ﻿keyboard ﻿keys ﻿(the ﻿overlay). ﻿This ﻿is ﻿how ﻿you ﻿define ﻿a ﻿frame. ﻿As ﻿you ﻿move ﻿either ﻿the ﻿image ﻿or ﻿the ﻿overlay, ﻿the ﻿lights ﻿on ﻿your ﻿keyboard ﻿update ﻿in ﻿real ﻿time. ﻿Move ﻿your ﻿picture ﻿around ﻿in ﻿the ﻿canvas ﻿by ﻿clicking ﻿and ﻿dragging. ﻿Click ﻿and ﻿drag ﻿in ﻿the ﻿lower-right ﻿corner ﻿of ﻿the ﻿picture ﻿to ﻿change ﻿the ﻿size ﻿and ﻿stretch. ﻿To ﻿move ﻿and ﻿resize ﻿the ﻿keyboard ﻿overlay, ﻿click ﻿on ﻿the ﻿"Drag/Resize ﻿Overlay” ﻿button. ﻿That ﻿button ﻿will ﻿stick ﻿down. ﻿Then ﻿drag ﻿the ﻿image ﻿of ﻿the ﻿overlay. ﻿Click ﻿the ﻿button ﻿again ﻿to ﻿go ﻿back ﻿to ﻿modifying ﻿the ﻿image. ﻿Use ﻿the ﻿Overlay ﻿Opacity ﻿slider ﻿to ﻿change ﻿the ﻿transparency ﻿of ﻿the ﻿overlay ﻿layer. ﻿This ﻿is ﻿a ﻿guide ﻿for ﻿you ﻿and ﻿has ﻿no ﻿effect ﻿on ﻿how ﻿the ﻿lights ﻿appear ﻿in ﻿the ﻿frame. ﻿In ﻿the ﻿area ﻿above ﻿the ﻿canvas, ﻿give ﻿your ﻿frame ﻿set ﻿a ﻿name. ﻿The ﻿name ﻿will ﻿be ﻿used ﻿when ﻿you ﻿save ﻿the ﻿frame ﻿set ﻿and ﻿when ﻿you ﻿export ﻿it ﻿to ﻿LGS. ﻿Load, ﻿save, ﻿and ﻿start ﻿a ﻿new ﻿frame ﻿set ﻿using ﻿the ﻿buttons. ﻿The ﻿center ﻿of ﻿the ﻿interface ﻿gives ﻿precision ﻿control ﻿over ﻿image ﻿and ﻿overlay ﻿size ﻿and ﻿location. ﻿The ﻿Load ﻿Picture ﻿button ﻿at ﻿the ﻿top ﻿will ﻿load ﻿a ﻿new ﻿image ﻿(PNG, ﻿JPG ﻿or ﻿GIF) ﻿into ﻿the ﻿canvas/frame. ﻿The ﻿new ﻿picture ﻿replaces ﻿the ﻿current ﻿picture ﻿and ﻿will ﻿appear ﻿centered ﻿in ﻿the ﻿view. ﻿However, ﻿if ﻿the ﻿loaded ﻿picture ﻿is ﻿exactly ﻿the ﻿same ﻿size ﻿as ﻿the ﻿current ﻿picture, ﻿it ﻿will ﻿keep ﻿the ﻿current ﻿picture’s ﻿location ﻿and ﻿size. ﻿If ﻿you ﻿have ﻿many ﻿images ﻿with ﻿the ﻿same ﻿dimensions ﻿(e.g. ﻿an ﻿animation), ﻿click ﻿the ﻿Load ﻿Sequence ﻿button ﻿after ﻿placing ﻿and ﻿sizing ﻿the ﻿first ﻿frame ﻿then ﻿select ﻿multiple ﻿files ﻿in ﻿the ﻿file ﻿selector ﻿window ﻿to ﻿instantly ﻿make ﻿frames ﻿from ﻿all ﻿of ﻿them. ﻿The ﻿numbers ﻿and ﻿arrows ﻿in ﻿the ﻿upper ﻿section ﻿show ﻿and ﻿control ﻿the ﻿exact ﻿location ﻿and ﻿size ﻿of ﻿the ﻿picture ﻿in ﻿the ﻿canvas. ﻿You ﻿can ﻿type ﻿numbers ﻿in ﻿the ﻿boxes. ﻿Click ﻿the ﻿1:1 ﻿button ﻿to ﻿force ﻿the ﻿image ﻿height ﻿to ﻿be ﻿in ﻿original ﻿proportion ﻿to ﻿the ﻿current ﻿width. ﻿The ﻿Overlay ﻿Control ﻿section ﻿shows ﻿and ﻿controls ﻿the ﻿location ﻿and ﻿size ﻿of ﻿the ﻿keyboard ﻿overlay ﻿that ﻿defines ﻿the ﻿frame. 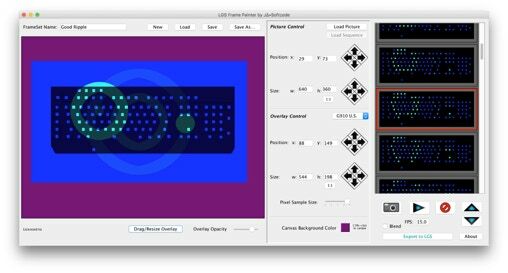 ﻿Pixel ﻿Sample ﻿Size ﻿controls ﻿color ﻿blending. ﻿When ﻿it’s ﻿fully ﻿left, ﻿the ﻿program ﻿samples ﻿a ﻿single ﻿pixel ﻿color ﻿in ﻿the ﻿picture ﻿for ﻿each ﻿key. ﻿Moving ﻿the ﻿picture ﻿only ﻿slightly ﻿can ﻿result ﻿in ﻿rapid ﻿color ﻿fluctuation. ﻿As ﻿you ﻿move ﻿the ﻿slider ﻿to ﻿the ﻿right, ﻿more ﻿pixels ﻿around ﻿the ﻿original ﻿one ﻿get ﻿averaged ﻿together ﻿as ﻿the ﻿color ﻿for ﻿each ﻿key. ﻿This ﻿will ﻿smooth ﻿color ﻿fluctuation ﻿as ﻿you ﻿move ﻿the ﻿image. ﻿Note, ﻿the ﻿edges ﻿of ﻿the ﻿picture ﻿are ﻿not ﻿blended ﻿with ﻿the ﻿background ﻿color. ﻿Click ﻿the ﻿Canvas ﻿Background ﻿Color ﻿patch ﻿to ﻿select ﻿a ﻿new ﻿canvas ﻿background ﻿color. ﻿CTRL-click ﻿in ﻿the ﻿canvas ﻿to ﻿set ﻿the ﻿background ﻿color ﻿to ﻿the ﻿color ﻿under ﻿the ﻿pointer. ﻿On ﻿the ﻿right ﻿side ﻿of ﻿the ﻿interface ﻿is ﻿the ﻿frame ﻿set ﻿sequencer. ﻿This ﻿large ﻿scrolling ﻿area ﻿shows ﻿the ﻿frames ﻿in ﻿the ﻿current ﻿frame ﻿set. ﻿You ﻿can ﻿add ﻿as ﻿many ﻿frames ﻿as ﻿fit ﻿in ﻿memory. ﻿Click ﻿to ﻿select ﻿a ﻿frame. ﻿The ﻿selected ﻿frame ﻿has ﻿a ﻿red ﻿box ﻿around ﻿it. ﻿Double ﻿click ﻿a ﻿frame ﻿to ﻿make ﻿the ﻿picture ﻿and ﻿overlay ﻿move ﻿and ﻿resize ﻿to ﻿match. ﻿Click ﻿the ﻿camera ﻿button ﻿to ﻿capture ﻿the ﻿current ﻿frame ﻿on ﻿the ﻿canvas ﻿into ﻿the ﻿frame ﻿set. 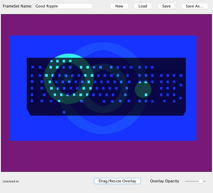 ﻿Click ﻿and ﻿hold ﻿the ﻿Play ﻿button ﻿to ﻿animate ﻿the ﻿frame ﻿set ﻿on ﻿your ﻿keyboard. ﻿The ﻿frames ﻿will ﻿change ﻿at ﻿the ﻿speed ﻿typed ﻿in ﻿the ﻿“frames ﻿per ﻿second” ﻿box. ﻿The ﻿frame ﻿set ﻿is ﻿always ﻿exported ﻿to ﻿LGS ﻿at ﻿that ﻿program’s ﻿fastest ﻿speed ﻿(about ﻿5 ﻿FPS); ﻿you ﻿can ﻿slow ﻿it ﻿down ﻿in ﻿LGS. ﻿Click ﻿the ﻿delete ﻿button ﻿to ﻿remove ﻿the ﻿selected ﻿frame ﻿from ﻿the ﻿frame ﻿set. ﻿There ﻿is ﻿no ﻿undo. ﻿Click ﻿the ﻿arrows ﻿to ﻿move ﻿the ﻿selected ﻿frame ﻿up ﻿or ﻿down ﻿(earlier ﻿or ﻿later) ﻿in ﻿the ﻿frame ﻿set. ﻿Click ﻿Export ﻿to ﻿LGS ﻿to ﻿save ﻿this ﻿frame ﻿set ﻿into ﻿an ﻿.eft ﻿file ﻿you ﻿can ﻿import ﻿into ﻿LGS ﻿for ﻿the ﻿"Your ﻿Effects" ﻿editor. ﻿You ﻿must ﻿register ﻿to ﻿use ﻿this ﻿feature. ﻿Click ﻿the ﻿Blend ﻿checkbox ﻿to ﻿create ﻿the ﻿.eft ﻿with ﻿smooth ﻿transitions, ﻿or ﻿leave ﻿it ﻿unchecked ﻿to ﻿appear ﻿with ﻿cut ﻿transitions ﻿in ﻿LGS. ﻿NOTE: ﻿Frame ﻿Painter ﻿for ﻿LGS ﻿does ﻿not ﻿read ﻿.eft ﻿files ﻿so ﻿be ﻿sure ﻿to ﻿also ﻿save ﻿your ﻿frame ﻿set ﻿using ﻿the ﻿Save ﻿button ﻿if ﻿you ﻿ever ﻿want ﻿to ﻿edit ﻿it ﻿again.